Let me ask you a question … Do your customers do everything you want them to do when you want them to do it? If your clients are like my clients, the answer would be a resounding NO, not usually. Just because we ask somebody to do something doesn’t necessarily mean that they’re going to do it – especially at the beginning stages in the relationship. That is why it is so important to use an email marketing system for follow-up messaging to build rapport and deepen the relationship with this new prospect, so they can feel comfortable making a small purchase from us. Let’s step back and look at the entire process and where follow-up messaging comes in. We have a user that hits our landing page… they like what they see so they decide to opt-in by giving us their name and email address. Their info gets sent to our email autoresponder. They get redirected to our thank you page. On that thank you page we let them know a few different things …. That we received their info which creates a positive user experience. Their content will be delivered soon. Once the new prospect makes that small purchase and finds out how great we are, the relationship changes. It doesn’t matter how small that first purchase is, just getting somebody to write you a check or break out their wallet and put in their credit card numbers on your order form, turns that person from a prospect into a customer. We are 7X more likely to sell stuff to a customer than we are to a prospect. The relationship building plays an extremely important part in the process. Give great value with the lead magnet. 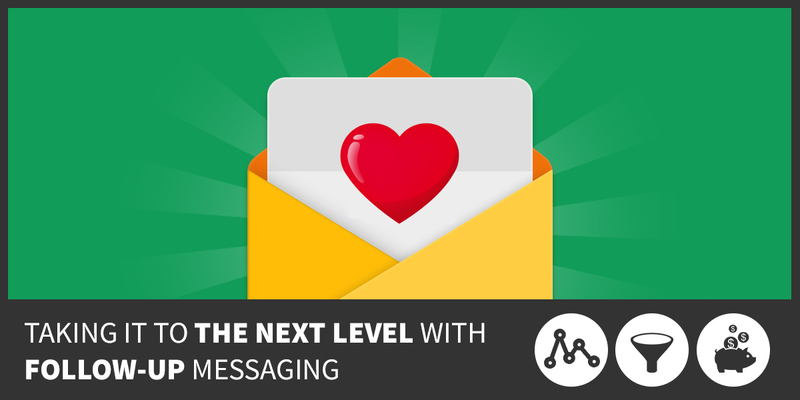 Build rapport and authority with our follow-up messaging. Once they know us, like us and trust us, we make a well positioned offer that they’d be foolish to pass up. We do that until our current staff is at capacity then we staff up. That’s how businesses are built. Use the comments section below and tell me how your follow-up messaging has changed your relationships with prospects?